May is not the ideal time to plan a coaster expedition to Austria, as quite a few potential locations are on weekend only operation. Our routing today gained us the only feasible credit given a requirement to be back in Vienna for a concert in the early evening. Those attempting to retrace our steps at a more suitable time of year would have more than enough time to fit in several additional stops such as the alpine coasters at Bergbahnen St. Corona and Eibl Jet Türnitz. Schöckl is a 1445m high mountain located roughly fifteen kilometres north of the city of Graz. The ridiculously fit have the option of accessing the summit by bicycle, but for the average reader the best option is a cable car that operates from the village of Sankt Radegund. A round trip ticket to the top costs €13.20, and cars operate continuously all day long. Readers should be aware that a cable car ticket is required to exit the village car park, so be careful not to throw yours away until after you've left the area. Hexenexpress is visible for the last minute or so of the cable car journey, with both the wide sweeping turns of the descent and the lift hill sticking out above slightly overgrown mountainside terrain. The ticket office is directly connected to the boarding platform, and there we paid €3.30 per person for our lap, bringing the total cost for the non-credit to €16.50 per person. This was quite a lot more than we'd have chosen to pay for a ride that was short in comparison to most Wiegand installations, and though the layout was respectable enough we decided not to invest in a second lap. The weather at the top of the mountain was ten degrees cooler than at ground level, and a layer of fog rendered the scenic overlooks worthless. After a few minutes of exploration we decided we'd seen all there was to see, and returned to the cable car ahead of schedule. Stubenbergsee Lake is a 40-hectare lake hidden in the mountains of southern Austria that features water slides, pedal boats, restaurants, and a small amusement park full of self-operated rides. During the summer months there is a nominal charge for admission, but in the off season the place is free to explore. Due to weather conditions we decided to limit ourselves to the amusement park and what turned out to be an excellent meal, though readers visiting on a sunny day should consider allowing an hour or so to follow walk around the facility. The amusement park is small but every last inch has been decorated with theming. There is no consistency whatsoever, but that just adds to the charm; the eclectic collection includes a full size police car, fiberglass farm animals, several model planes, pirates, indians, and a bright pink convertible under a canopy awning. Several rides from Sunkid Heege take pride of place, including Banane (#2221), a mark one Butterfly with the original yellow car. 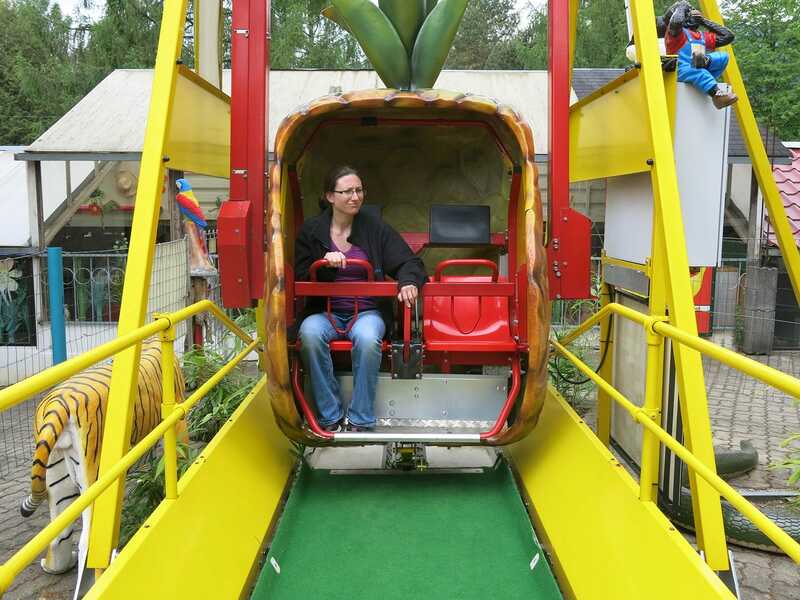 Megan also rode Jungle Loop, a self-operated two seater swing ride in which the car remained upright at all times while moving through a 360° arc. It took her a few minutes to get the hang of the controls but in due course she managed to get the ride up to speed, describing it as whirling around like high school boys swinging lanyard key chains or a whirligig. Our second visit to Prater in as many days was planned as a thirty minute stop to try to get on the credits that we'd missed the day before. We were initially excited at finding the shutters up on the pay box for Race, but there was a hand-written sign in the window saying achterbahn geschlossen and that was that. However, Boomerang was open, and better yet it had been upgraded with the new train design we'd encountered three days before in France. We also noticed that the track had also been fitted with at least fifty fluorescent tubes, presumably to make it look striking after nightfall. The ride quality was just fine, and a very worthwhile use of €5. We concluded our visit with a farewell lap in the front row of Olympia Looping that was quite simply superb. With luck we'll get to ride again at some stage in the future, but if we don't then we at least have the memories.